A complex web of challenges lies ahead for the newly-born Telangana state. 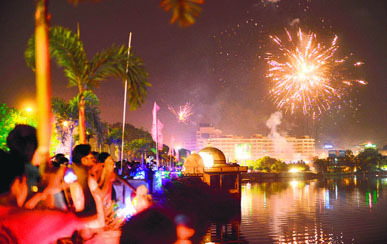 Barring Hyderabad, the region is largely backward and cannot boast of any major industries. Acute power crisis, unemployment, funds crunch and inadequate irrigation are among the major problems that concern the new state. Odisha Chief Minister Naveen Patnaik's and Prime Minister Narendra Modi meeting today and the scheduled meeting between Modi and Tamil Nadu Chief Minister Jayalalithaa tomorrow are being closely watched in the political circles here. These offer a study in contrast as Patnaik's BJD and Jayalalithaa's AIADMK were not in the BJP camp. Prime Minister Narendra Modi today asked his Cabinet colleagues to follow the BJP manifesto and deliver what the party had promised to public in its pre-poll presentations by ensuring that the welfare schemes trickle down to all. He also asked them to overlook family while doing selfless work for people. In a clear indication that it may break away from the BJP, Shiv Sena today declared its party chief Uddhav Thackeray as its chief ministerial candidate for the forthcoming Assembly elections in Maharashtra. Is the BJP’s dream run in Uttar Pradesh, where it won a staggering 71 of the 80 Lok Sabha seats, under threat? As many as 22 of the newly elected MPs who face serious criminal charges may lose their parliament seat if they are convicted under the Supreme Court directive of wrapping up cases related to lawmakers within one year. In a significant move apparently at the instance of the All India Congress Committee (AICC), Assam Chief Minister Tarun Gogoi today called the leader of the dissident Congress MLAs, Dr Himanta Bishwa Sharma, for discussions amid speculations about reshuffle of the ministry to accommodate some dissident MLAs. Before meeting Health and Education Minister Dr Sharma, Gogoi called in a senior Congress MLA close to the dissident camp, Sarat Borkotoky, for discussions. 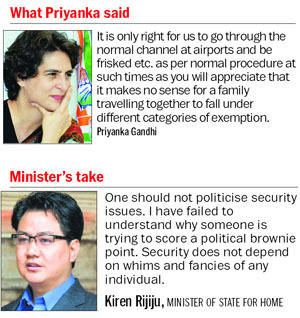 In the wake of Priyanka Gandhi asking the SPG to withdraw exemptions given to her family from security checks, Union Minister of State for Home Kiren Rijiju today asked why she was trying score a “brownie point” as security does not depend on “someone’s whims and fancies”. Cabinet Secretary Ajit Seth was today given six months extension in service, just 12 days before he was supposed to retire, in an apparent move to ensure continuity by the new Narendra Modi government. The extension of Seth (62) was approved by Appointments Committee of the Cabinet, headed by the Prime Minister. This is second extension for Seth who was given one-year extension by the previous UPA government last June. Nearly 60,000 of the 73,000 government primary schools in Bihar, mostly in rural areas, do not have a “proper” headmaster. “Eighty per cent of the primary schools in Bihar are running without proper headmasters. In many places, teachers have been made in charge of these schools to manage it on temporary basis..., “ an official of the education department said. The first meeting of the Special Investigating Team (SIT) on black money discussed modalities and road map to proceed further. According to a statement issued, the meeting was held here today under the chairmanship of Justice M B Shah, former Supreme Court judge. Union Minister of Urban Development, Housing and Urban Poverty Alleviation M Venkaiah Naidu said the government was committed to the goal of ‘housing for all by 2022’. Addressing a high-level meeting with the ministry officials and various other stakeholders, the minister pointed out that 2022 is the 75th year of India’s freedom when the dream of the urban poor for housing needed to be realised. Following pressure built up by seven-time Varanasi South MLA Shyamdeo Roy Chaudhury's indefinite hunger strike, Chief Minister Akhilesh Yadav has made Prime Minister Narendra Modi's constituency a power cut-free district. Maharashtra Chief Minister Prithiviraj Chavan today expanded his cabinet by including two more members. Amit Deshmukh, MLA from Latur and son of former Chief Minister Vilasrao Deshmukh, and Abdul Sattar Abdul Nabi, MLA from Sillod in Jalna were today administered the oath of office and secrecy by Governor K Sankaranarayanan. The Supreme Court today stayed the execution of Yakub Memon, sentenced to death for masterminding the 1993 serial blasts in Mumbai in which 257 people were killed and over 700 injured. Telangana Rashtra Samithi founder president and Chief Minister K Chandrasekhar Rao, who is widely seen as an architect of the statehood movement, has his task cut out. The biggest challenge before him is to come up with a development vision that addresses the region's backwardness, a trigger for the statehood agitation. Apart from finding resources to speed up irrigation and power projects and to fund a series of populist promises made in the run-up to the elections, the TRS government needs to address the fears and concerns of a large number of people from Seemandhra who have made Hyderabad their home. The major challenge is to retain the brand image of Hyderabad which has served as an economic powerhouse of the erstwhile Andhra Pradesh since its inception in 1956, attracting investors and livelihood-seekers from Seemandhra in equal measure. There are fears that the "Brand Hyderabad", built over years on the back of strong Information Technology and Pharma sectors, might take a beating post-bifurcation. KCR, as the TRS chief is known in political circles, has the toughest challenge ahead of him to ensure that Hyderabad continues to be a preferred international investment destination. With a population of 80 lakh, of which about 40 percent are migrants from Seemandhra, the city accounted for over 30 percent of the erstwhile AP's revenues. More than 90% of the private sector investment that came to Hyderabad was from entrepreneurs from Seemandhra region. Also, 65% of the Union government's revenues from AP were collected from Hyderabad metropolitan area. It contributed nearly Rs 90,000 crore to AP's taxes kitty annually and accounts for software exports of Rs 60,000 crore. Not surprisingly, there are fears over the safety for huge investments made by Seemandhra settlers since the formation of AP in 1956. There are also fears that there would be a flight of capital from the city as a major chunk of big investors hail from Seemandhra. The new state starts with an acute power deficit. According to experts, it requires nearly Rs 7,000 crore annually to buy power from other states. Several irrigation projects have been pending for decades. Being mostly an upland area, it requires lift irrigation projects on a massive scale, entailing huge costs. Telangana was once a stronghold of Maoists, so much so that several areas were virtually under their control. There are fears that the new state could witness revival of naxalite activity. At present, almost the entire top leadership of CPI (Maoist) is from Telangana. They are now active in the neighbouring Chhattisgarh, Jharkhand, Odisha and West Bengal. The pangs of bifurcation are likely to haunt the new state. The distribution of assets and liabilities, allotment of employees and fixing the ratio for sharing of power, water, revenues and taxes between the two states have become a daunting task for the officials managing the transition process. 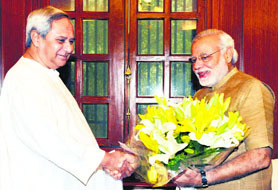 Odisha Chief Minister Naveen Patnaik's and Prime Minister Narendra Modi meeting today and the scheduled meeting between Modi and Tamil Nadu Chief Minister Jayalalithaa tomorrow are being closely watched in the political circles here. These offer a study in contrast as Patnaik's BJD and Jayalalithaa's AIADMK were not in the BJP camp. Having snapped its ties in 2009, the BJD preferred to plough the lonely furrow while the AIADMK chief added fuel by attacking Modi during the campaign. The overtures from the BJP camp and response from these two regional satraps can be summarised as complementary and supplementary. The collective strength of these parties in Parliament stands at 61 MPs , 57 in the Lok Sabha (AIADMK 37 and BJD 20) and 14 in the Rajya Sabha (AIADMK 10 and BJD 4). With an absolute majority in the Lok Sabha, the ruling coalition is comfortable in the lower house but it is in minority in the upper house with just 46 MPs. On the other side, the two Chief Ministers would want to be on the right side of the new government at the Centre. In the run-up to the elections, the AIADMK and the BJD mingled with non-Congress, non-BJP parties, but that altered after the BJP emerged triumphant. Now, both these parties are second and third largest parties on the other side of the aisle. Today, the Odisha CM petitioned the Centre with a list of seven demands, including special category status for the state, revision of royalty, imposition of tax on mining profits, Rs 4,550 crore special Central assistance for two events, including the Naba Kalvera of Lord Jagannath to be held in 2016, and intervention in the Polavaram irrigation project in Andhra that would submerge 130 villages in Malkangiri district. Patnaik MPs accompanying him expressed satisfaction at the positive response from the Prime Minister, with one senior MP Bharatruhari Mahatab stating that Modi told the delegation that he believed that the Centre could progress only when states move ahead. In his first marathon Cabinet meeting, the decisions of which are likely to be reflected in President Pranab Mukherjee’s address to the joint sitting of Parliament next week, Prime Minister Modi asked his Cabinet colleagues to ensure transparency in the system to help the BJP fulfill its promises. Modi's first meeting with his Council of Ministers lasted for over three hours at his residence and was followed by dinner. He urged his 45-member team to ensure government schemes trickled down to one and all and stressed on efficient governance and time-bound implementation of the work. The meeting took place against the backdrop of Modi's 10-point agenda which includes increasing investment, completing infrastructure projects in a a time-bound manner and exploiting natural resources, besides giving freedom to bureaucrats to take decisions and implement them. Modi reportedly asked his ministers to come up with progress report on various projects initiated by the previous UPA government at the earliest so that work on them could begin. He also directed his ministers to choose their staff members carefully and strictly told them against employing their relatives. Last week, Modi issued a set of 10 commandments to various ministries on what the guiding principles should be in terms of functioning, empowering the bureaucracy, putting it to place institutional mechanism to make decision making swifter. Modi at the meeting talked about his ideas on how to boost the economy, attract greater investment and improve infrastructure. The discussions are believed to have centred around the 100-day agenda which Modi had asked his ministerial colleagues to set by identifying priorities. Modi has told them to take their Ministers of State along in implementation of programmes and that he would be regularly meeting them as also the Secretaries individually. “The next chief minister of Maharashtra will only be from the Shiv Sena. And the Shiv Sena party wants Uddhav Thackeray to be the man who leads the state. If there has to be change in Maharashtra, only Shiv Sena can do it. Uddhav never wanted to be the chief minister, but the party wants him to be one,” Sanjay Raut, party spokesman and editor of Shiv Sena mouthpiece Saamna, told reporters today. The Shiv Sena also kicked off a campaign in the social media along the lines of the “Ab Ki Baar, Modi Sarkar” campaign undertaken by the BJP ahead of the just-concluded Lok Sabha elections. The Shiv Sena shows only Uddhav Thackeray as the face of the campaign for the Assembly elections. Observers say that the Shiv Sena is preparing to go it alone in the Assembly elections. 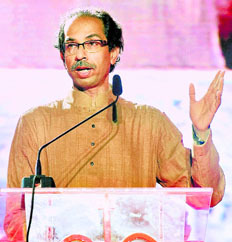 At a meeting of party office-bearers in Mumbai on Sunday, Uddhav Thackeray spoke only of the party’s performance during the Lok Sabha elections. The Shiv Sena had won 18 of the 20 seats it contested. Thackeray did not mention a word of the BJP and there was no references to Narendra Modi as well. And today’s edition of Saamna took potshots at BJP leader Gopinath Munde with whom Thackeray had enjoyed a close relationship for more than 20 years. “Narendra Modi will decide who will be the BJP’s candidate to lead Maharashtra. Munde has been sent on loan to the Centre for three months,” the piece in Saamna said. Observers say, the party is preparing to play the anti-Gujarati card. Sanjay Raut had earlier written an editorial on the occasion of Maharashtra Day accusing the Gujarati community of ignoring Maharashtra “even though they had used the wealth generated from Mumbai to build palaces in their villages”. Mumbai became part of Maharashtra after huge protests when Gujarat was carved out of the erstwhile Bombay state. The Chief Minister Morarji Desai had ordered police to open fire on the demonstrators demanding the inclusion of Mumbai in Maharashtra, a point that still fuels anger towards the Gujaratis. An apex court bench chaired by Justice RM Lodha (now the Chief Justice of India) had March 10 ruled that all cases faced by MPs should be heard promptly and the judicial process completed within one year. The Bench also ruled that cases under sections 8(1), 8(2) and 8(3) of the Representation of the People Act should be heard daily and the verdicts pronounced in not more than a year. Among the leading BJP MPs in trouble are Uma Bharti, Murli Manohar Joshi, Sakshi Maharaj, Yogi Adityanath and Sadhvi Niranjan Bharti. Uma Bharti, a former Chief Minister of Madhya Pradesh, is accused of making inflammatory speeches, inciting hatred and rioting. Joshi battles similar charges. Both can be jailed for up to two years if the charges are proved. Sakshi Maharaj, another senior BJP MP, is accused of murder, dacoity and attempt to murder. Lallu Singh, MP from Faizabad, is charged with dacoity, obstructing government work and tampering with evidence. Brij Bhushan Sharan Singh, the Qaiserganj MP, has several serious cases slapped on him. The Association for Democratic Reforms (ADR) confirms that the number of MPs from Uttar Pradesh facing serious criminal charges is 22. Other BJP MPs who face such charges include Ram Shankar Katheria, Ajay Kumar, Bhairon Prasad Mishra, Keshav Prasad, Kunwar Bhartendu, Sanjeev Baliyan, Sadhvi Niranjan Bharati, Kaushal Kishore, Bharat Singh, Harishchandra Dwivedi, Kunwar Sarvesh Kumar, Babulal and Rajendra Agarwal. BJP ally Apna Dal’s two MPs - Anupriya Patel and Kunwar Harivansh Singh - too face major criminal charges. What could be worrying for the BJP is that charge sheets have been filed against 15 of the MPs. BJP leaders, however, trash the charges and say all the cases against the MPs were politically motivated and would not stand scrutiny in courts. “We gave Lok Sabha ticket to the MPs only when we were convinced that the cases had political overtones,” Vijay Bahadur Pathak, the BJP UP spokesman, said. Dr Sharma refused to comment on the problem brewing in the Assam Congress Legislature Party (ACLP), saying that the issue was now being tackled by an AICC-appointed panel comprising Ghulam Nabi Azad, CP Joshi and Motilal Vora. He said the AICC had barred party MLAs in Assam to talk to the media on the current ACLP-related problems. “The Chief Minister called me to discuss the current political situation in the state after the party’s poor show in the recent elections. I have presented before him 10 points which, I believe, were key reasons for the poll debacle. I have raised points such as failure to tackle riot in Bodoland areas where Muslims have alienated from the party, failure to implement the Food Security Act, doubtful voters’ issue that alienated Bengali-speaking people from the party etc. I have requested him to try resolving these issues so that the party can retain power in the state in 2016 Assembly polls,” Dr Sharma said. He said the ball was now in the court of the chief minister to make or break the party. 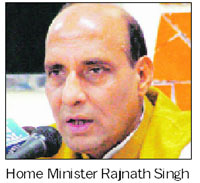 He virtually asked Gogoi to quit in the greater interest of revamping the party. Gogoi left for New Delhi in the afternoon to meet the AICC leaders, triggering speculations about effecting reshuffle in the state Cabinet. “One should not politicise security issues. I have failed to understand why someone is trying to score a political brownie point. Security does not depend on whims and fancies of any individual,” Rijiju told reporters here without naming Priyanka. He was responding to a question on Priyanka’s letter to SPG chief where she asked the organisation to withdraw the exemption given to her and her family from normal security checks at airports, a plea that comes in the wake of reports that government is considering cancellation of such a facility to her husband Robert Vadra. “It is better to leave to the security agencies to take a decision,” Rijiju said. In a letter to the SPG chief Durga Prasad, Priyanka referred to media reports of possible removal of her husband’s name from the list of security protectees exempt from security checks at airports and said she would appreciate if it is done at the earliest. Priyanka said Vadra’s inclusion in the list was made at the instance of previous SPG chiefs and Delhi Police and not upon any request by “either of us who were informed after the fact”. The extension for Seth given by the new government is apparently to ensure continuity in view of the fact that it has to settle down quickly and start implementing the electoral promises and the need to prepare for the budget session of Parliament likely to be held in July. According to officials, senior teachers were not been promoted to the post of headmasters as they failed to fulfill some qualifications and criteria as per the government policy. At present, there are 85,000 permanent primary school teachers who get a monthly salary, unlike over one lakh contractual teachers in primary schools. Amarjit Sinha, principal secretary at the education department, said the government is serious to speed up appointments and promotion of headmasters in primary schools. During the meeting, detailed modalities of the proceedings further with the Supreme Court mandate were discussed and the road map decided.s SIT was recently constituted to implement the decision of the Supreme Court on large amounts of money stashed abroad by evading taxes or generated through unlawful activities. The next meeting of the SIT will be convened shortly to take stock of the follow-up of the decisions taken in this meeting. 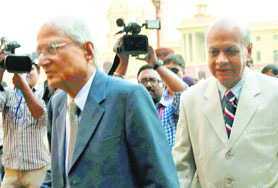 Former judges of the Supreme Court MB Shah and Arijit Pasayat are chairman and vice-chairman, respectively, of the SIT. The high-powered committee comprises top bosses of the country’s key investigation, enforcement and intelligence agencies. The 11-member list includes Revenue Secretary, RBI Deputy Governor, Intelligence Bureau Director, Director of Enforcement Directorate, CBI Director, CBDT Chairman, Director General of the Narcotics Control Bureau, DG Directorate of Revenue Intelligence, Director of Financial Intelligence Unit, Secretary of Research and Analysis Wing and the Joint Secretary (Foreign Tax and Tax Research) in the Finance Ministry. Union Minister of Urban Development, Housing and Urban Poverty Alleviation M Venkaiah Naidu said the government was committed to the goal of ‘housing for all by 2022’. Addressing a high-level meeting with the ministry officials and various other stakeholders, the minister pointed out that 2022 is the 75th year of India’s freedom when the dream of the urban poor for housing needed to be realised. He emphasised that the government would focus on planned housing with necessary facilities in the coming years since 50 per cent of the population of the country is expected to live in urban areas by 2050. “Housing for all is a challenging task since the ministry has only Rs. 35,000 crore to provide affordable housing and for slum development in the 12th Plan while the requirement is much larger. It is for this reason that the public private partnership and corporate social responsibility are required in this sector,” Naidu said. One of the stakeholders informed the minister that the housing investment of nearly Rs 5 lakh crore was stuck due to want of various clearances He said all these issues would be taken up in the coming 100 days and concerns of all stake holders would be addressed. Akhilesh today directed MD of Purvanchal Vidyut Vitaran Nigam Ltd AP Mishra to ensure uninterrupted power supply in Varanasi. The CM made the announcement after talking to the Varanasi MLA. Roy had begun his hunger strike on May 27 demanding power cut-free status for Varanasi. During the elections, the high-profile constituencies of Varanasi and Azamgarh were getting round-the-clock power supply. While Azamgarh continued to get uninterrupted electricity supply even after the polls, power cuts were back in Varanasi. Congress president Sonia Gandhi's constituency Rae Bareli and other constituencies of SP leaders such as Etawa and Kannauj are among a handful of areas in the power deficit state that get 24-hour power supply. This is the second time in less than a week that Chavan had expanded his team. Last Thursday, Nationalist Congress Party leader Jitendra Awhad was inducted as medical education minister. Awhad replaced former minister Vijaykumar Gavit, who was sacked after his daughter Heena contested the Lok Sabha polls on a BJP ticket. She won the elections from the Nandurbar seat. Chavan, Deputy Chief Minister Ajit Pawar, their cabinet colleagues, legislators and other senior leaders and officials were present on the occasion. A summer vacation Bench comprising Justices JS Khehar and C Nagappan also issued notice to the Maharashtra Government and the Centre seeking their response to Memon’s plea against sending him to the gallows. The Bench clarified that his writ petition would be heard by a Constitution Bench along with a similar plea made by another death row convict, Mohammed Arif alias Ashfaq, involved in the 2000 attack on an army battalion stationed at Red Fort here in 2000 killing three jawans. In his petition, Memon has pleaded for open court hearing of review petitions in death sentence cases, instead of the usual practice of in-chamber decisions.